Deutsche Bank’s new chief executive needs to learn some painful lessons from Anshu Jain. Investors fed up with the bank’s slow progress on cutting costs and boosting capital have cheered news of the co-CEO’s departure after three years in charge. New broom John Cryan should study his predecessor’s mistakes. For starters, Cryan needs to end questions over Deutsche’s capital shortfall. When Jain and co-CEO Juergen Fitschen took charge in June 2012, the bank’s equity cushion was wafer-thin as a proportion of both gross and risk-weighted assets. But by prioritising the creation of capital via retained earnings, Jain missed an opportunity for an early rights issue. Instead, investors were forced to shell out for capital increases in each of the following two years. Even now, Deutsche’s leverage ratio of 3.4 percent at the end of March is well short of its new 5 percent target. Cryan’s other big challenge will be cutting costs. Jain and Fitschen failed to deliver on almost all the three-year targets they set for Deutsche in September 2012. The power of German labour unions stymied their efforts to cut deeper in retail banking. Costs absorbed 80 percent of the division’s revenue last year, higher than in 2012. It’s true that Deutsche was forced to swallow increased expenses for complying with new regulations, especially reporting requirements. But as the former head of Deutsche’s investment banking unit Jain should have been more aware of the institution’s shortcomings. Cryan is less likely to underestimate the post-crisis regulatory burden. Reconciling the requirements of the business and the realities of politics will not be easy, however. As a member of Deutsche’s unwieldy 19-strong supervisory board, Cryan will be acutely conscious of the difficulty of building consensus. That will make it hard for him to deviate dramatically from the new strategy laid out by Jain and Fitschen in April. Still, bringing forward detail on where cost cuts will fall is essential. An uptick in shareholder fury, expressed in a 39 percent vote against Deutsche’s management at the bank’s annual meeting in May, stemmed from vagueness over where the bank would chop. For Cryan, Jain’s tenure is a reminder that speed is essential. 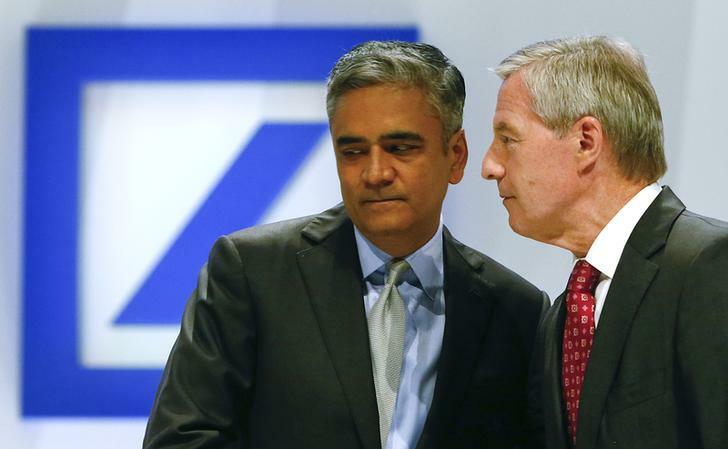 Anshu Jain (L) and Juergen Fitschen, Co-chief Executives of Deutsche Bank speak during a shareholders meeting in Frankfurt, May 23, 2013. Deutsche shares rose 6 percent to 29.29 euros by 0800 GMT on June 8.